Spring is a fantastic time for dude ranch vacations. Whether it’s a spring break escape with the family in Arizona or a late May or early June guest ranch vacation further north, the Spur Alliance has the right options to match your vacation interests. Some dude ranches feature special packages and deals during the spring season as well. Spring’s gorgeous weather is perfect for the kinds of vacation activities that guest ranches offer. Those seeking a warm weather spring dude ranch vacation should head for the Spur Alliance’s dude ranches in Arizona. Both White Stallion Ranch and Tanque Verde Ranch offer exceptional horseback riding for guests, with rides to match a wide variety of abilities and age ranges. There’s so much to do at both of the Spur Alliance’s Arizona ranches during a spring dude ranch vacation. In addition to horseback riding, White Stallion guests can also enjoy rock climbing, hiking, swimming, rodeo activities and more. At Tanque Verde, guests can combine horseback riding with fishing, mountain biking, swimming, jeep adventures and other activities. Tanque Verde Ranch has a complimentary Daily Kids Club for ages 4-12 and White Stallion Ranch offers lots of activities the whole family can enjoy together, making both great choices for a spring break getaway with the kids. Kids under five stay free year-round at White Stallion Ranch and two kids ages 4-11 stay free at Tanque Verde Ranch from June 1 to September 30. Spring ranch vacations are exciting at The Hideout Lodge & Guest Ranch, a year-round dude ranch in Shell, Wyoming. 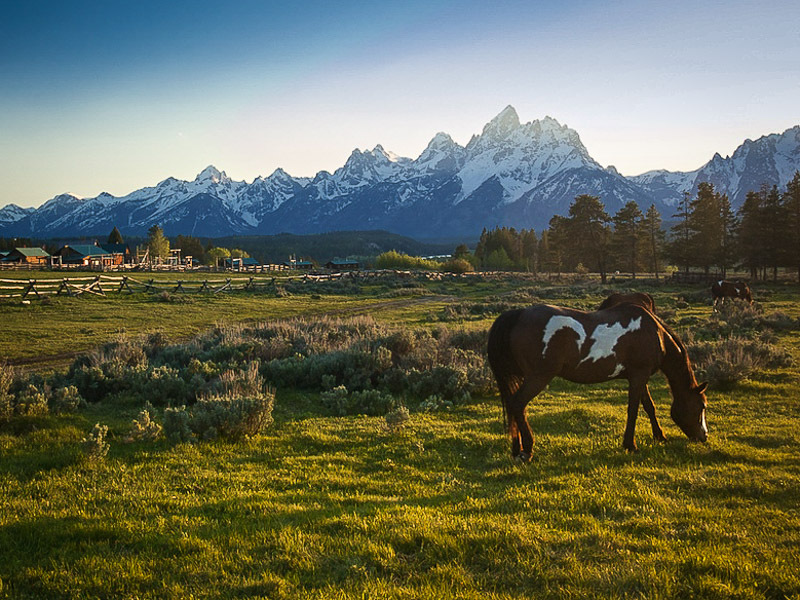 The guest ranch’s spring season begins in mid-March and runs through the first part of June. In addition to superb horseback riding, guests at The Hideout can participate in a broad range of adventure vacation activities including hiking, biking, trapshooting, fly fishing, archery and other sports. Opportunities for early spring dude ranch vacations are also available at Lost Valley Ranch, a Spur Alliance member ranch located about 90 minutes from Colorado Springs, Colorado. A minimum stay of only two nights is required, making this guest ranch a great choice for a spring long weekend getaway. March and April rates are particularly attractive. In addition to guided horseback rides through Pike National Forest, guests at Lost Valley can take part in a number of hikes and other activities. Late spring opens up a wide range of guest ranch vacation options at Spur Alliance ranches. Seasonal dude ranches open in late May and early June in California, Colorado, Montana, Wyoming and British Columbia, Canada. Some ranches offer unique activities during these time periods, while others offer special lower rates and packages. At California’s Hunewill Ranch, for example, guests can help with moving cows and other spring cattle work. This fun opportunity for intermediate to advanced riders is available during a four-night stay from May 31 to June 4, 2016. In addition, the ranch also offers adults-only early bird specials during the first part of June. Travelers seeking an incredible deal on their late spring dude ranch vacations may wish to book a June Canadian guest ranch getaway at the Spur Alliance’s Three Bars Ranch in British Columbia this year. Currently, one U.S. dollar buys $1.32 CAD in goods and services, making a Canadian dude ranch vacation an outstanding value. Horseback riders can save 20% on their June riding vacations, while non-riding guests save more than 25% as compared with Three Bars Ranch’s standard summer rates. In addition to twice-daily horseback rides, the dude ranch features guided hiking, mountain biking, gold panning, archery and other activities in its late spring all-inclusive vacation packages. Now is the perfect time to plan your spring dude ranch vacation. Check out all the dude ranch profiles on the Spur Alliance website and get ready to ride! We know you’ll find the right match here.